Payments as low as $96/mo. Or, apply & pay as little as $96/mo. Wow, this guitar is ridiculous!! It is definitely an eye-catcher that harkens back to an older time, but it's full of all the innovations Suhr has spoiled us with over the years. The Pau Ferro board is a joy to play and like all Moderns, the neck is super fast and easy to play. All your legato licks will come with ease but you can also lay into it as hard as you want. Get ready to turn heads and melt faces with another outstanding offering from one of the most incredible builders around! 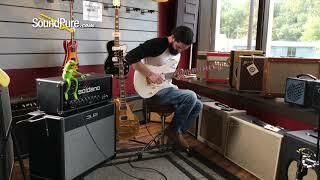 In this video, Sound Pure electric guitar specialist Michael Buckley plays a Suhr Custom Modern through a Soldano Hot Rod amp and a 3rd Power cab. Brand new for 2018 the Modern features a basswood body, plain maple top, and maple neck with pau ferro fingerboard. The Modern retains many of the most popular specifications of the Modern Pro including the sleek elliptical neck profile, balanced asymmetrical body, innovative neck heel, and stainless steel frets. At Suhr Guitars, we don’t merely produce some of the finest hand-crafted guitars and amplifiers – we produce dreams that inspire musical passion and artistic creativity. Our fervent dedication to the highest quality standards possible, our famous fanatical attention to detail, our ears for tone, and our love for music ranging from rock to country to jazz to blues to pop to metal to fusion are all evident in every instrument we produce. The passion to build the very best possible is the underlying current of what Suhr Guitars is all about. From there comes the vision of John Suhr to design and create the best instruments possible. From there the skill of experienced master craftsmen, technological know-how, and the hard work of dedicated employees who truly love what they’re doing take over to produce modern works of art that discriminating artists and musicians will savor for a lifetime. Body Top Wood: Plain Maple, 2 Piece, 3/16"